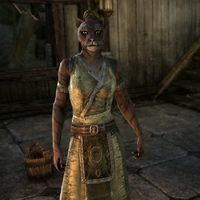 Azbi-ra is a Khajiit living on the Speckled Shell Plantation. She is the sister of Zaban-ma and the daughter of Yanalir. She started brewing skooma to help support her remaining family. However, in a rage, her brother burnt her equipment, as well as the house it was stored in. The Family Business: Decide the fate of a moon sugar farming family. You can either start the quest by speaking to Azbi-ra directly or being directed there by Officer Lorin. If the former, you can overhear Azbi-ra say, "Hush, father. I won't leave your side." as she tends to her injured father. "Father burned in the fire, my brother missing … S'rendarr, show mercy!" "Our moon-sugar storehouses caught fire. Father thought to save our livelihood. He ran inside, and …. The burns weren't bad, but the sweet-smoke ruined his lungs. Without powerful medicine, he won't last the day." "Father tried to save our alchemical tools. If they survived the fire, I could trade them for medicine. Please, it's all I can do to keep my father alive. This one begs you to salvage the tools from our storehouses!" I'll find any tools that survived the fire. If you were directed to her by Officer Lorin, then you will instead tell her that you were sent to ask about the fire. Officer Lorin said there was a fire at your plantation. "Yes, our moon-sugar storehouses burnt in the night. My father ran inside to save our tools, but he barely made it out. Do you hear his wheezing? The sweet-smoke ruined his lungs. He needs powerful medicine, or he won't last until morning." "Father tried to save our alchemical tools. If any survive, we could trade them for medicine. Please, this one begs you to salvage any tools from the wreckage! There's little time for my father." Both dialogues converge after you agree to help. "Please return quickly with the tools. If I can't trade them for medicine, this one's father will die." What crops do you grow here? "You know of moon-sugar, yes? The moon-sugar cane grows well on these isles. With my people's sweet tooth, there can never be enough to sprinkle on our meals." Why do farmers need alchemical tools? "We must pay our debts. If our neighbors own more land, how do we match their crops at market? We must turn to alchemy to grow better crops, yes?" Did you grow better crops? "Yes, our crops came in much bigger this season. Not that it matters now." You mentioned your brother is missing? "Yes, Zaban-ma shares a temper with hurricanes. After a great quarrel with this one, he stormed off and left us short-clawed. Father had to cancel his trip to Mistral, and now he's …." If you return to Azbi-ra after finding the burnt and useless alchemical tools and encountering Zaban-ma, Yanalir will have gotten worse and Azbi-ra will say, "Father's breathing grows ragged. This one doesn't know what else to do." Once you have uncovered the skooma hidden by the shore, you can return to the house, only to find that Yanalir has died and Officer Lorin is suspicious of everyone involved. Azbi-ra will kneeling next to her father's grave. "Gone … father is gone. Why would Zaban-ma destroy his own family? Please, leave me to my sorrow." does she say anything different if you turn her in to Officer Lorin? This page was last modified on 6 March 2019, at 01:14.